learn more stuff: Mowbot 2.0 lives! I started with a new deck and 1 inch square tubing. 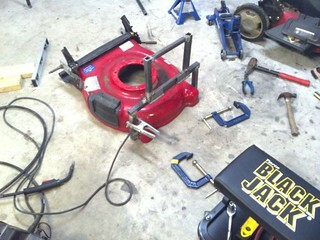 After many hours, I have added a control panel (the toolbox), grass catcher, adjustable height, and master power switch. 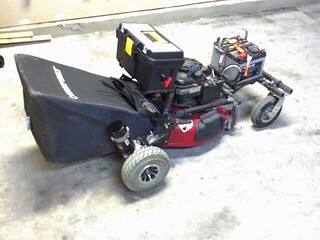 It mows quite nicely, but the back wheels do not get very good traction. I will soon be swapping out the battery and control panel positions to try and put some more weight over the rear wheels.